Back Forty Bees, located in Williamsburg, VA, specializes in raw, chemical-free, high-quality honey, bees, and bee related products. We are family owned, providing local Virginia raw honey, bees (local nucs and packages), equipment, and handcrafted hive-related products. 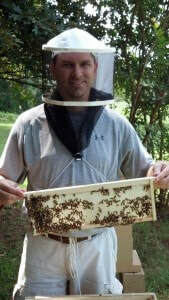 Like many small apiaries, we started out with a few hives and have naturally grown over the years. Well, the short answer is, my wife would not let me have chickens! I was looking for a new hobby and, after nixing chickens, my wife suggested bees. I began researching them online, joined the local beekeepers association, met other beekeepers, bought some books, watched about 12,000 YouTube videos, and finally ordered some bees. Since this all began I now make and sell equipment, extract local honey, and raise honey bees for sale (nucs) in various out yards, and sell package bees every spring. A local publication – Next Door Neighbors – featured me in a very nice article. You can get to know a lot more about me in the article below.